Beautiful engraved RARE specimen certificate from the Wordstar International Incorporated dated in 1989. This historic document was printed by United States Bank Note Company and has an ornate border around it with a vignette of the company name. This item is over 18 years old. WordStar was a word processor application, published by MicroPro, originally written for the CP/M operating system but later ported to DOS, that enjoyed a dominant market share during the early to mid-1980s. Although Seymour I. Rubinstein was the principal owner of the company, Rob Barnaby was the sole author of the early versions of the program; starting with WordStar 4.0, the program was built on new code written principally by Peter Mierau. WordStar was originally developed for CP/M in 1978. It was the most feature-rich and easy-to-use word processor available for this operating system, and became a de facto standard. In 1981 WordStar version 2.26 was bundled with the Osborne 1 portable computer. Notably, WordStar was the last commercial word processor supporting the CP/M operating system. Release 4, the final CP/M compatible version, was sold with 5�" floppy disk as a default, and an 8" version as an option. WordStar 4 for CP/M, released 1987 - The 3.0 version of WordStar for DOS was released in April 1982. The DOS version was very similar to the original, and although the IBM PC featured arrow keys and separate function keys, the traditional "WordStar diamond" and other Ctrl-key functions were retained, leading to rapid adoption by former CP/M users. WordStar's ability to use a "non-document" mode to create text files without formatting made it popular among programmers for writing code. The first DOS version was a direct port of the CP/M version, and therefore only used 64K of RAM even though DOS supported up to 640K. Users quickly learned they could make this version of WordStar run dramatically faster by using the ability of DOS to create a "RAM disk" in memory, and copy the WordStar program files into it. WordStar would still access the "disk" repeatedly, but the far faster access of the RAM drive compared to a floppy disk yielded a substantial speed improvement. However, edited versions of a document were "Saved" only to this RAM disk, and had to be copied to physical magnetic media before rebooting. By the mid-1980s WordStar was the most popular word processing software in the world. But IBM dominated the "dedicated word processor" market with its "DisplayWrite" application, which ran on machines dedicated to writing and editing documents. There were many dedicated word processing machines at the time, but IBM's main competition was Wang Laboratories. Such machines were expensive and were generally accessed through terminals connected to central mainframe or midrange computers. When IBM announced it was bringing to market a PC version called "DisplayWriter," MicroPro focused on creating a clone of it which they marketed as "WordStar 2000." 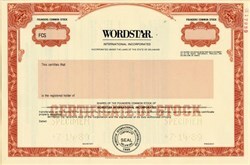 Neither program was as successful as its developers had hoped, and the lack of attention MicroPro had paid to the original WordStar in the meantime, coupled with WordStar 2000's poor support for WordStar formats and keystrokes, had allowed competing products an opportunity to take over market share. WordPerfect, in particular, used the same key sequences as the popular Wang line of dedicated word processor computers, which made it popular with secretaries switching from those to PCs. MicroPro International restructured as WordStar International and rehired many of the WordStar programmers who had left the company during the WordStar 2000 diversion, and in October 1986 acquired the code for NewWord, a WordStar clone with extended capabilities, written principally by Peter Mierau at his company NewStar. WordStar used the NewWord codebase to produce upgraded versions, adding such long-desired features at an unerase and distinctive on-screen colorization for bold, italics, and other print effects. The first version built on the NewWord codebase was dubbed WordStar (or WordStar Professional 4.0) and it was released for DOS and CP/M operating systems. Later versions -- 5.0, 5.5, 6.0, and 7.0 -- were only released for DOS; the new releases rebuilt some of the lost market share. An internal struggle between the "old timer" developers of version 6.5 (aimed at Microsoft Word users), and the "young turks" working on version 7.0 (aimed at WordPerfect users), led to the former product being scrapped and the latter product released years ahead of its originally scheduled launch date; 7.0 Revision D, released in December 1992, was the final DOS version of the program. Like many other producers of successful DOS applications, WordStar International delayed before deciding to make a version for the commercially successful Windows 3.0. The company purchased Legacy, an existing Windows-based word processor, which was altered and released as WordStar for Windows in 1991. It was a well-reviewed product and included many features normally only found in more expensive desktop publishing packages. However, its delayed launch meant that Microsoft Word had already firmly established itself as the corporate standard during the two previous years. WordStar for Windows 2.0, released 1992Although WordStar is no longer developed or maintained by its owners, it is not abandonware. It is currently the property of Riverdeep, Inc., an education and consumer software company headquartered in San Francisco, California. WordStar is still actively used by several hundred members of the WordStar Users Group Mailing List. They provide technical support for each other via the long-running mailing list which started in May 1996 and has continued to this day without interruption (but with one major move from Cuenet to WordStar2 in 2003). There are also free downloads of updated macros and scripts, printer and mouse drivers, and other utilities on the WordStar Users Group web pages. WordStar is still considered by many to be one of the best examples of a "writing program." Because it was designed for text-only display devices with only a single, functional typeface, the primary focus was on the text, without direct onscreen WYSIWYG formatting. Because typesetting and layout were secondary or tertiary functions left for after the document was written, edited, and proofread, the writer was not distracted by the many formatting possibilities presented by later word processors. As initially installed, in text-mode versions of WordStar, approximately the top 1/3rd of the screen was a menu of commands, with the very top line being a display of the position within the file and the user's text occupying the lower 2/3rds of the screen. A user-configurable option to set the help level released this space for user text. The help system could be configured to display help a short time after the first key of a command sequence was entered. As users became more familiar with the command sequences, the help system could be set to provide less and less assistance until finally all on-screen menus and status information was turned off. The original computer terminals and microcomputers for which WordStar was developed did not have an array of separate function keys or cursor control keys (e.g., arrow keys, Page Up/Down), so WordStar used sequences of alphabetic keys combined with the "Control" key. For touch typists, in addition, reaching the function and cursor keys generally requires them to take their fingers off the "home keys" with consequent loss of typing rhythm. For example, the "diamond" of Ctrl-S/E/D/X moved the cursors one character or line to the left, up, right, or down. Ctrl-A/F (to the outside of the "diamond") moved the cursor a full word left/right, and Ctrl-R/C (just "past" the Ctrl keys for up and down) scrolled a full page up/down. Prefacing these keystrokes with Ctrl-Q generally expanded their action, moving the cursor to the end/beginning of the line, end/beginning of the document, etc. Ctrl-H would backspace and delete. Commands to enable bold or italics, printing, blocking text to copy or delete, saving or retrieving files from disk, etc. were typically a short sequence of keystrokes, such as Ctrl-P-B for bold, or Ctrl-K-S to save a file. Formatting codes would appear on screen, such ^B for bold, ^Y for italics, and ^S for underscoring. Although many of these keystroke sequences were far from self-evident, they tended to lend themselves to mnemonic devices (e.g., Ctrl-Print-Bold, Ctrl-blocK-Save), and regular users quickly learned them through muscle memory, enabling them to rapidly navigate documents by touch, rather than memorizing "Ctrl-S = cursor left." the lower-case letters and numbers, upper-case letters and symbols accessed by the Caps key, and editing and formatting made possible by the Ctrl keys. WordStar had relative weaknesses, such as an inability to reformat line justification as text was typed or deleted. Thus paragraphs had to be reformatted by command after edits and changes. But a command could be given to reformat the entire document after it had been edited or re-written. Many of these weaknesses were corrected with a new interface in WordStar 2000. Reformatting of paragraphs became automatic. Most of the mnemonics were made simpler so that ^RW would Remove a Word, ^RR would Remove the Right side of a line (right of the cursor), ^RS would Remove a Sentence, and so on. WordStar 2000 was also rare among word processing programs in that it permitted the user to mark (highlight) a block of text (with ^BB for Block Begin and ^BE for Block End) and leave it marked in place, and then go to a different section and copy it (with ^BC for Block Copy). Many users found it much easier to manipulate blocks with the block commands rather than the Microsoft Word system of highlighting with a mouse. The main problem with these improvements was that users of legacy WordStar (non-WordStar 2000) were quite happy with that interface and did not want to change to a new one. The WordStar interface left a large legacy. This includes modern cross-platform word processing software like TextMaker and many text editors running under MS-DOS, Linux, and other UNIX variants, which can emulate the WordStar keyboard commands using Ctrl-key combinations. The popular Turbo Pascal compiler used WordStar keyboard commands in its IDE editor. Modern word processing software like Write&Set not only use the WordStar interface, but have been based on WordStar DOS file formats, allowing WordStar users who no longer have a copy of the application to easily open and edit their files. There are WordStar keyboard command emulators and keymappings, both freeware and shareware, for current versions of Microsoft Word. Popular modern word processing software like WordPerfect, StarOffice and Microsoft Word (with the proper filters) can open and save to WordStar documents, enabling users to move back and forth. MailMerge was an add-on program (becoming an integrated part of the main product with WordStar 4) which allowed a "merge printing" for mass mailings of letters. Pertinent data, like name, address, city, state, zip code, and so on was stored in non-document datafiles. Documents like business letters could be printed in series by inserting data fields in "master documents". These master documents contained "boilerplate" text, like business letters, with data fields in place of addressee-pertinent information. By printing "x" number of versions of the master document, for example, letters customized for various recipients could be printed in series by drawing information from the datafiles and inserted in place of the fields. Thus mass mailings could be prepared with each letter being individually addressed. Other add-on programs included SpellStar, a spell checker program, later incorporated as a direct part of the WordStar program; and DataStar, a program whose purpose was specifically to expedite creating of the datafiles used for merge printing. These were revolutionary features for personal computer users during the early-to-mid-1980s. A companion spreadsheet, CalcStar, was also produced using a somewhat WordStar-like interface; collectively, WordStar (wordprocessing), DataStar (database management), and CalcStar (spreadsheet) composed the first-ever office suite of personal computer programs. WordStar identified files as either "document" or "nondocument," which led to some confusion among users. "Document" referred to WordStar wordprocessing files containing embedded and hidden word processing and formatting commands. "Nondocument" files were pure ASCII text files containing no embedded formatting commands. Using WordStar in "Nondocument Mode" was essentially the same as using a traditional "text editor," but with more advanced text editing features than found in some mainframe-based editors. Installation of early versions of WordStar, especially for CP/M, was very different from the approach of modern programs. While later editions had more-or-less comprehensive installation programs that allowed selection of printers and terminals from a menu, in the very early releases, each of the escape sequences required for the terminal and printer had to be identified in the hardware documentation, then hand-entered into reserved locations in the program memory image. This was a fairly typical limitation of all CP/M programs of the time, since there was no mechanism to hide the complexities of the underlying hardware from the application program. Occasionally short machine-language programs had to be entered in a patch area in WordStar, to provide particular screen effects or cope with particular printers. Researching, testing, and proving out such installations was a time-consuming and knowledge-intensive process, making WordStar installation and customization a staple discussion of CP/M users' groups during that time. MS DOS versions of WordStar at least had standardized the screen display, but still had to be customized for different printers. WordStar version 3.x uses the MS-DOS File control block (FCB) interface, an early data structure for file input/output which was based closely on CP/M's file input/output functions. This use of the FCB data structure was intended to make porting (assembly language) programs from CP/M to (the then-new) MS-DOS easy. When MS-DOS adopted the Xenix-like filesystem, it became a legacy interface supported by MS-DOS for backwards compatibility. Because this compatibility has not been maintained, WordStar 3.x will not function properly on modern versions of Windows. In particular, the WordStar 3.x program can't save files. One solution for users, or historical researchers, wishing to run this program is to use the DOSEMU emulator on Linux. It correctly implements the FCB interface. (The DOSBox emulator does not, even on Linux.) Version 4.0, which is almost identical to 3.x, does not have this problem and uses the newer MS-DOS interfaces for input/output. Although no current version of WordStar is available for modern operating systems, some former WordStar users still prefer WordStar�s interface, especially the cursor diamond commands described earlier in this article. These users claim less hand movement is necessary to issue commands, and hence that writing under this interface is more efficient. The user accesses the nearby Ctrl key and then a letter or combination of letters, thus keeping his hands on or close to the typing home row instead of moving them away from it to reach for a specialty key or a mouse. To accommodate these users, WordStar emulation programs were created. One such program is CtrlPlus by Yoji Hagiya, which remaps the standard PC keyboard, making many WordStar commands available in most Windows programs. CtrlPlus switches the Control and Caps Lock keys so that the Ctrl key is back where it originally was on older keyboards, next to the A key. It also gives functionality to the chief cursor diamond commands mentioned in this article. The other WordStar emulation utility created was the WordStar Command Emulator for Microsoft Word, also known as "WordStar for Word," by Mike Petrie. Designed to work in conjunction with CtrlPlus, the Command Emulator adds many more WordStar commands to MS Word than CtrlPlus by itself, and also changes Word�s menus to be more like those of WordStar 7.0 for DOS, the last MS DOS version of WordStar. For example, Ctrl+K? was WordStar�s word count command and Ctrl+QL was its spell check command. Hitting these commands in the WordStar Emulator within Word runs Word�s equivalent commands. WordStar for Word also adds WordStar�s block commands, namely Ctrl+KB to mark the beginning of a block, Ctrl+KK to mark the end, and Ctrl+KV to move it. Alternatively, Ctrl+KC could be used to copy the block. The WordStar Command Emulator is written in Microsoft Visual BASIC for Applications, a macro programming language based on Visual BASIC built into Microsoft Word to allow for a high level of customization. Most Word plug-ins are written in this language also known as VBA. There isn't a WordStar 2000 for Windows. WordStar for Windows was also released under the name WordStar Personal Writer, and is a development of WordStar Legacy itself developed from a program called Legacy. XOOM also released a version of WordStar for Windows 2.0 called Xoom Word Pro.